The residents of Queen’s Harbour enjoy a wide range of outdoor activities year-round. One of the highlights of the community is a junior-olympic-sized swimming pool which is open to residents year-round. Lifeguards are on duty from mid-june through mid-August, and a children’s pool is located nearby as well. The pool is open daily from 6:00 AM until 10:00 PM. 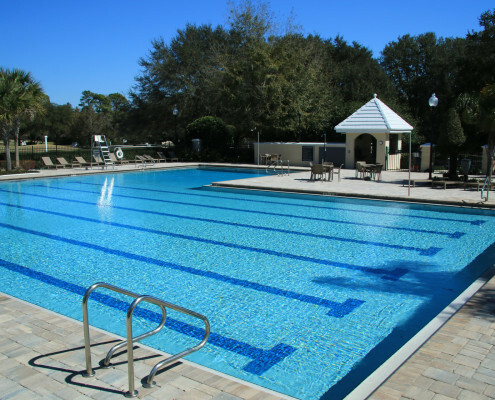 A full renovation of the pool was completed in December 2015. In addition to the pool, Queen’s Harbour has a golf course that is part of the ClubCorp network nationwide. We have a women’s golf association, with all skill levels welcome. The Ladies Golf Association welcomes players of all ages and skill levels, with both a 9-hole and 18-hole sub group. Both groups play every Tuesday and Thursday morning. Members of both groups can also take advantage of the Interclub alliance with other similar associations in the Jacksonville area, opening up play on multiple golf courses throughout the season. The association also hosts a variety of tournaments, scrambles and invitationals throughout the season, which often include lunches and prizes to winners. The group also hosts an annual Holiday Banquet at the Queen’s Harbour Club, with all members welcome to attend. Membership is open to any female 18 years or older who is a member of the Queen’s Harbour Yacht and Country Club and who is eligible to compete in 9-18 holes of golf. Our members living inside and outside of the community, are working women, mothers and grandmothers. Some have played for years, some are returning to the game and others are beginners. We all enjoy the game of golf in our own unique ways. It can be played individually or as part of a team. Golf is a sport where all ability levels can play on an even playing field. Handicaps are used as an equalizer. You don’t have to be a scratch golfer to love the game. The Queen’s Harbour Yacht Club takes advantage of the fresh-water basin that is part of the community, with ties to the Intracoastal waterway and the Atlantic Ocean, for a full range of boating activities. The club welcomes enthusiasts of all ages and experience levels, for activities ranging from a lazy trip down the river to King Fishing tournaments. The lock system that gives access to the waterways will accommodate yachts up to 100 feet, but no boat is required to join in the fun. Visit the dedicated website, Queen’s Harbour Yacht Club for details. The Yacht Club has also initiated a sailing club called Sail Queen’s Harbour, using small boats to teach the essentials of sailing to adults and children.